These Galway Crystal Claddagh champagne glasses are sold by the pair. 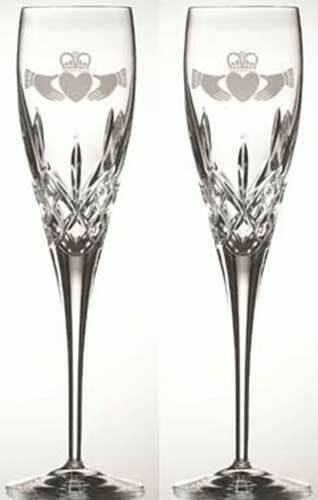 These Claddagh champagne flutes are made of 24% leaded crystal. 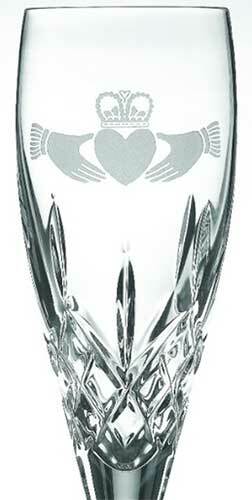 The crystal champagne flutes feature an etched Claddagh icon along with a cut motif. The Irish champagne glasses measure 10.4" tall x 2.6" wide at the base and 1.6" wide at the rim; the crystal champagne glasses are an ideal Irish wedding gift. The Irish glasses are made by Galway Crystal and are gift boxed with a Claddagh history card, complements of The Irish Gift House.